A new policy proposal is in the works, allowing U.S. gun manufacturers to sell their firearms abroad. 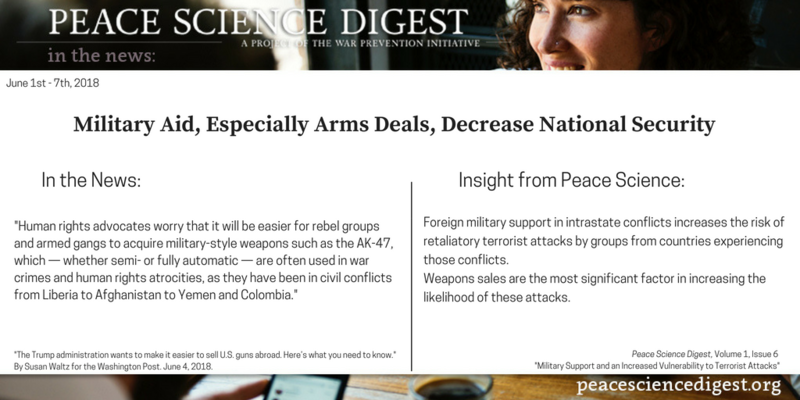 Peace Science shows how arms deals compromise national security. The Trump administration has proposed making it easier for U.S. gun companies to sell their firearms abroad. Under this proposal, Semiautomatic weapons would no longer be regulated as military equipment and it will be much more difficult for regulatory bodies to control the spread of weapons abroad-making it much easier for anyone to obtain powerful weapons. Foreign military support in intrastate conflicts increases the risk of retaliatory terrorist attacks by groups from countries experiencing those conflicts. Weapons sales are the most significant factor in increasing the likelihood of these attacks. “The Trump administration wants to make it easier to sell U.S. guns abroad. Here’s what you need to know.” By Susan Waltz for the Washington Post. June 4, 2018.